Well, we have now had our solar panels in action for one year. We wanted to wait until we had 12 months of statements so that we could really get nerdy on the facts with you. 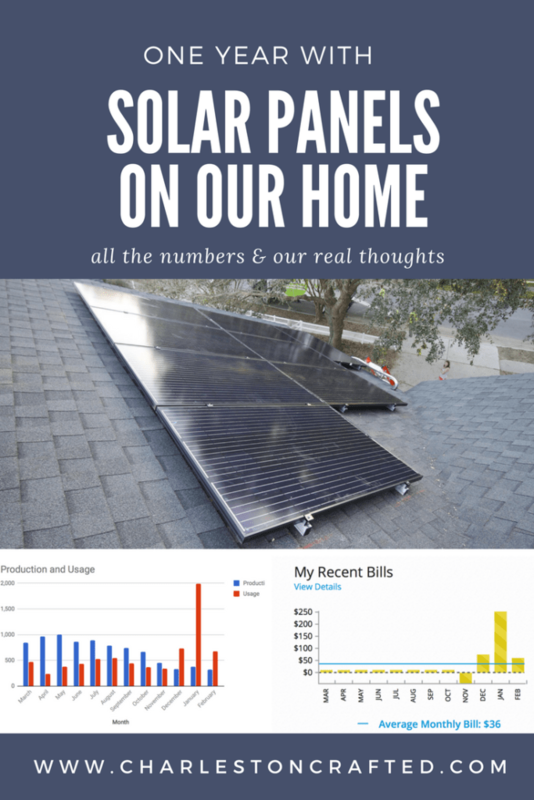 In case you are interested, here is our post about how and why we got the solar panels. One of the biggest questions that we get is “are solar panels worth it?” So I decided to really break it down for you today! What was the total cost? The total cost was $29,000. What do you pay each month? We have a monthly loan payment (on the solar panels) of $145. That includes an 2.99% interest rate and we currently have a balance on there of around $7,500. We also have to pay an $11.46 fee to SCE&G each month. This is a “hook up” fee and honestly wasn’t described to me in advance. I was told we would get no bill. You’ll notice this was a pattern in our experience. I don’t know if I was deliberately misled or just didn’t know the right questions to ask. Finally, we have to pay for any electricity any month that we use in excess of our production, because the panels don’t store excess energy we create in any other month. We’ve had to do that in December and January and February. What has the production vs. usage been? As you can see, most months we produced way more than we used. I would conclude from this year that the solar panels are fantastic in warm, sunny months and definitely cover our AC usage. We are on a heat pump which uses a ton of power to create heat. We had a freak snow in January (once in a decade around here!) 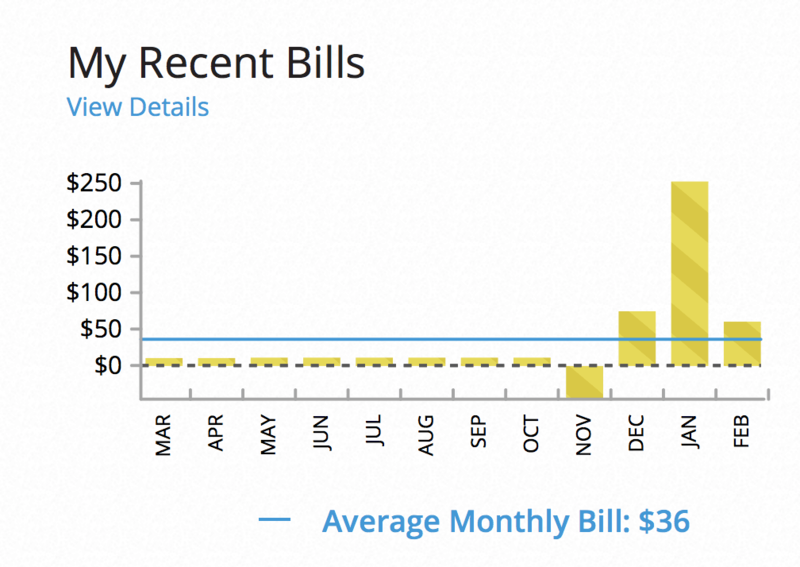 and people’s energy bills were double-triple the average month across the board. I really wish that we were able to store and use some of that summer energy! What do you get paid for any excess produced? How does that work? This was one of the biggest surprises for us. We knew that we produced a lot more than we used in the first 6 months. However, when we got our overage statement (in November) we learned that while SCE&G charges us 12 cents per kwh, they only pay out about 3 cents per kwh. While not shocking, this was still very disappointing and seems very sketchy. So for 1,624 kwh of excess produced, we received $57. This was paid to us as a credit towards our future bills, and you can see it as the negative bill in November. I wish that the KWH could have been saved and used as a credit based on KWH for the winter, but they made it a credit based on $ instead, so it only went about 1/4 as far. I didn’t really consider this in advance (no one mentioned it to me and blame it on my first time home owner naivety), but our solar panel loan required us to add the solar panels to our home insurance policy. Makes sense, since we still owe on them, we need their value covered in case of an emergency. Well, I did that, didn’t think about it. 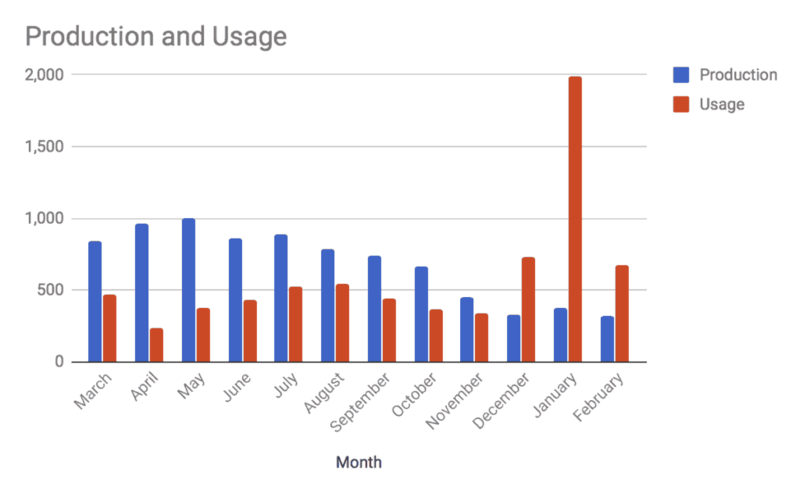 This year we got our escrow statement and found out that we owed almost $2,000 for last year and that our payments were going up over $150 a month due to insurance increases. While it wasn’t entirely due to the solar panels, I was told that a lot of it was for that coverage. $150 a month is more than our monthly electric bill so that was honestly shocking. Secondly, I really think that I would feel so much happier with and better about our solar panels if we could store power ourselves with a backup battery. I have heard that technology is becoming more cost effective thanks to Tesla and I am really hopeful that that turns out to be a good option for this home. A back up battery would allow you to have power during outages (huge since there is no natural gas in our neighborhood) and it would let you store all that excess and use it instead of being credited a tiny fraction of it’s “street value” and having to pay in months that you under-produce. Right now, batteries are cost-prohibitive but would definitely be great to have. I have honestly been underwhelmed by the financial benefits of the solar panels. We are still paying a lot per month. The overage payouts have been less lucrative than I had hoped. We have owed additional electric charges several times. I am glad for the benefits to the earth of producing some clean energy and I am still hopeful that it will add long term resale value to our home. We also think that we’ll feel better about them once we have completely paid them off, because we will only be receiving the small monthly admin charge at that point. But, so far, financially, it hasn’t been a huge win. Do you have any more questions for us?! You know it saddens me to hear someone describe their solar experience as underwhelming. I also hate to hear that anyone has done the industry a disservice by not fully educating the customer. Some comments I have on your experience. OK, a lot of comments I have. * I am curious on the size of your system. I am hoping, at that price, it is in the range of 7.25kW. But looking at the production amounts, it does not seem the system is that large, or your home has a less than ideal orientation for productivity (which would impact your ROI). * Thank you for your advice about the Federal Tax Credit in managing expectations. To clarify further, you need to assure you have the tax appetite or indebtedness to receive the full credit. So in your case, $8,700. But if someone cannot receive the credit in the first year, the balance can be rolled for up to 5 years. * You obtained a great loan structure to both take advantage of the tax credit with 0% interest as a separate loan, as well as a 2.99% rate with no prepayment penalties. Almost doesn’t make sense to pay that loan off early. Unless your mortgage rate is the same, wouldn’t you be better off paying down your mortgage? Just a thought. 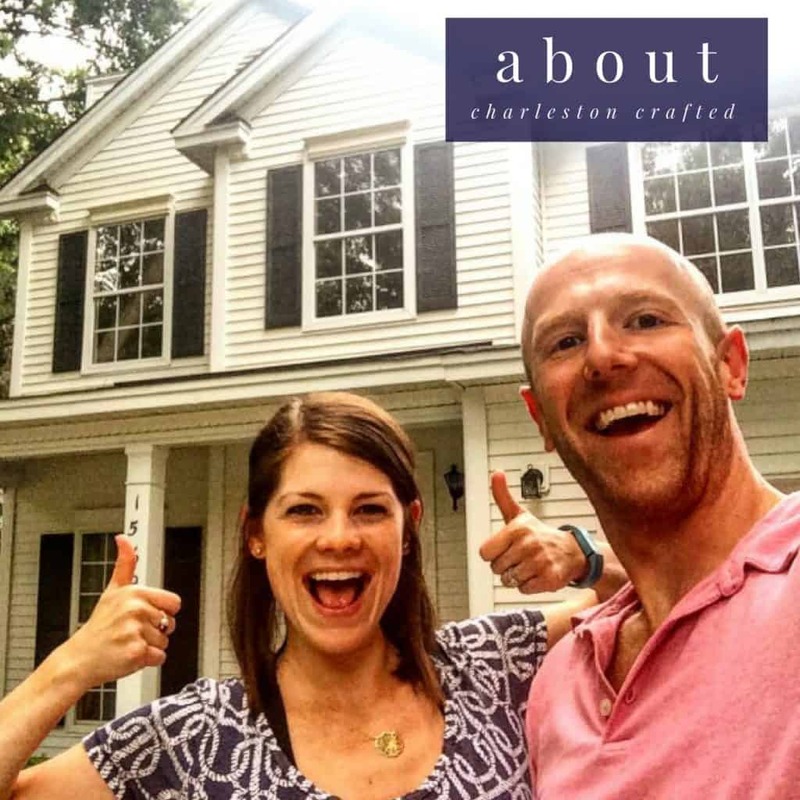 * A 25% South Carolina incentive is an amazing incentive. * The “hook-up” fee you describe, or customer fee, of course should have been explained to you. People are always annoyed at having to still pay this fee, especially if they are generating 100% of their electricity. But this fee covers the cost of you being connected to grid. Being connected to the grid enables the grid to essentially operate as your battery. It is there for your system to have a place to send excess electricity when you are not using all that it is generating, and for you to draw electricity when you are not generating. If someone, e.g., shuts down their vacation home for the season and turns off their electricity, they still have to pay the customer fee. They aren’t using any electricity, but the utility still has to have the grid available for their use if they show up and turn the electricity on. The fee really should not be a part of the financial equation when evaluating solar. You should NEVER have been told you would get no bill, and this fee should have been identified in their financial modeling. * Regarding your excess energy produced, I am a little confused at how you described this. After I read your comments I thought that South Carolina must not have Net Metering, but they do. Essentially, your excess energy generation is rolled over each month and would credit against your usage in months where you under-produce. If at the end of a 12 month period you have generated more than you used, the utility will pay you for this excess, but is required only to pay you at the wholesale rate. This is essentially fair because they run their business based on electricity rates that they secure in advance contracts. So if they can purchase energy for $.035/kWh, there is not much of an argument for having to pay you the $.12/kWh retail rate once you have crossed into the category of being a generator, rather than an off-taker. This is why your installer SHOULD have only designed a system based upon your 12 month estimated usage and have not designed for any excess production. Once you are paying for a system large enough to over-produce, the ROI declines rapidly. If they designed a system with approximately 2,000 kWh excess production annually, they should have identified this in their financial modeling. If anything is sketchy, it is not SCE&G. And trust me, defending utilities is not something I do typically. * You should take your $16,200 in tax incentives and your energy savings and buy an electric vehicle. Then you can capitalize on another potential $7,500 Federal Tax Credit; and use your excess generation to power your vehicle rather than get $.03/kWh for it. * Of everything you discussed, your increase in your homeowners insurance is completely shocking. First, once again, your installer should have mentioned that you would want to add these to your insurance – you are not naive. But the increase should have been nominal. When I added my system, a 5kW, I did not even notice a change in my rate. Something is quite amiss if they have increased your rate anywhere near $150 per month for a $29,000 home improvement. You need to run this up the flagpole asap. The underwriter has no idea what they are doing. And please do not ever remove them from your insurance. When that tree in the background of your photo falls on your house, you’re going to be happy the solar is covered in the damages. * In the end, I think once you get your homeowners insurance issue resolved, your valuation of solar will change drastically. You made a $29,000 investment and are getting the government to pay you back for 56% of it. Your payback period is relatively low for something that will generate electricity for likely over 30 years (as electricity rates continue to rise higher than $.12/kWh). You immediately increased the value of your home. I would like to know the real ROI and where you believe you could have made a greater, guaranteed, investment decision elsewhere. Thanks for all the comments. It’s obviously something you’re passionate about and have done a lot of research on. All we can really speak to is how our experience has been so far. They installed a system that was expected to produce 98% of our needed energy, but during most months, we actually produced closer to 105%, which is why we were owed. We were credited, but our usage doesn’t roll over, which is what we are saying we would obviously prefer, that way when we underproduced, we would still not be paying because of what we had produced before, but that isn’t how they do it here. We’ll certainly look into some of the other stuff you mentioned, but our goal here was just to inform people on what we have seen in a year. Thanks for following!